“Who will speak for the armless and the mouthless?” bellowed The Lorax. And just like that, Q*bert hopped into view, answering the call and taking the mantle upon his non-existent shoulders. “Speaking” through his nose. Exclusively in alien swear words. Was he merely a fuzzy orange tennis ball that had mutated into an anthropomorphic freak with feet and an oversized honker that wouldn’t be out of place serving duty as the air horn on a Kenworth or was he the mildly retarded second cousin of that famous prehistoric suzerain The Great Gazoo? We don’t know and we can’t know. The game took John Travolta’s dance floor from Saturday Night Fever and expanded it into an M.C. Escher-like pyramid. Q*bert, who wasn’t in any physical condition to be involved in any sword fights, merely had to hop onto the squares of the pyramid and change their color in order to win the game. It sounds easy, but there were a few spanners in the works, namely Sam and Slick, two sub-moronic “friends” of Q*bert who meant him no harm but still randomly wandered about the place like Tenderloin crackheads, reversing all of our man’s good work by changing the colored squares back to their original color and thus hindering Q from getting to the next level. Worse still was Coily, a villainous viper whose shape was the direct inspiration for those weird light bulbs our government has strong-armed all of us into using. 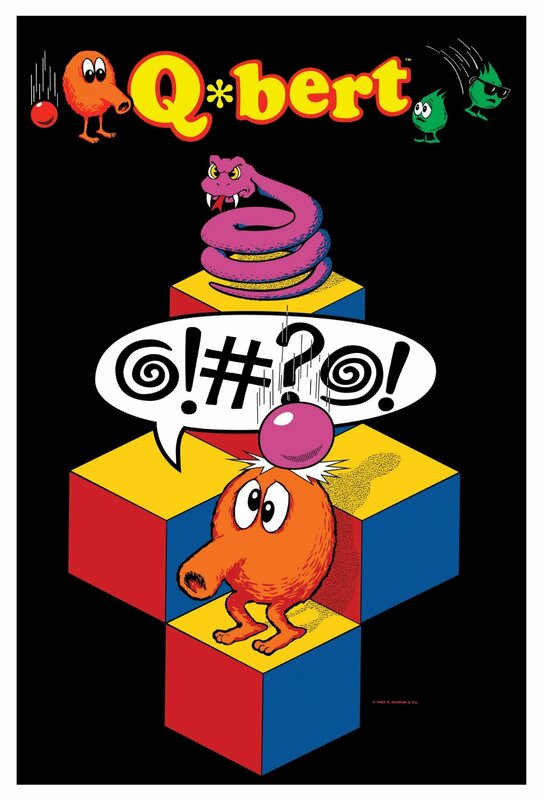 This snake was a nasty piece of work, voraciously hungry and always ready to sink his fangs into Q*bert like he was some fresh-off-the-tree tangerine. Q*bert is only able to escape Coily’s grasp by hopping onto a colorful disc that is eerily similar to Apple’s notorious “Spinning Wheel of Death.” It’s like the makers of this game predicted the entire 21st Century!! I’ve heard the Q-Dawg got some props in the 2012 movie Wreck-It Ralph, but I haven’t seen it!